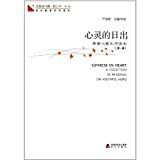 青春读书课•心灵的日出:第1册 : Sunrise in Heart A Collection of Readings on Youthful Mind / 严凌君. Publisher: 海天出版社. Edition: 第1版 (2012年1月1日).Description: 299页 : 简体中文 ; 23.8 x 16.4 x 2.2 cm.ISBN: 9787550701816.